It’s definitely an exciting and hectic time. Over the years there are a few things I’ve found to be MUSTS when heading back to my classroom. 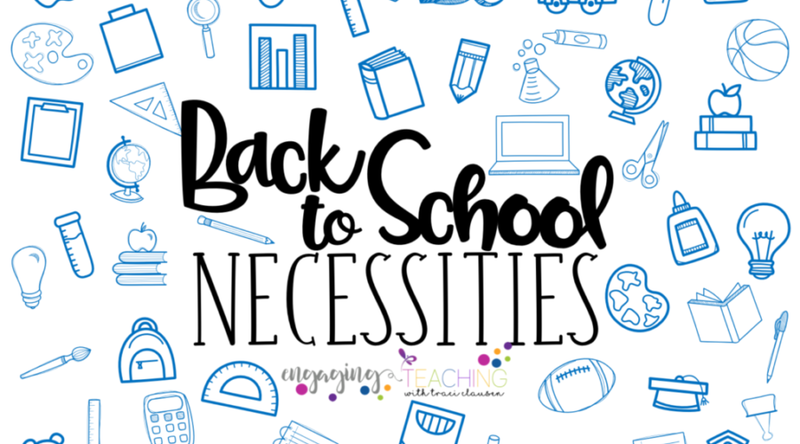 Here are a few back to school essentials that help get the school year off to a great start! Setting the “tone” with parents right from the beginning that you are approachable, there for their child, care deeply and work your tail off to help their kiddo succeed is super important. You want to be professional, yet sincere and easy to talk to. I set up a REMIND account so my kiddos parents and I can keep in contact. It’s easy to use. Basically it is texting (group or individual) without anyone having to know anyone else’s phone number. I use Remind for all kinds of things. To send out school and class announcements. Ask if little Johnny is feeling ok because he’s been kind of sleepy all day. Remind Susie’s parents that she needs her permission slip turned in by tomorrow. Tell Fred’s job what an amazing job he is doing today and send her a photo of his latest masterpiece. Remind is free and super easy to use. You can give your parents a code to join your Remind group. They can chat with you privately this way. It works on your computer and mobile devices. Remind also has codes you can add to websites so that whole class announcements that you’ve sent up will automatically show up on your site. I give my kiddos parents a Parent Guide that summarizes first grade at our back-to-school/parent information night. The post about this also shares the FREE welcome and first day letters I send home (also editable). Click here to see more images and info about the Parent Guide. This doesn’t have to be fancy – but it should send the message that you want parents to associate with you. You don’t have to get the kids involved with it – although you could! Mine is simple, but informative about a few essentials. Here’s a screenshot. Make a habit of communicating with your parents on a routine basis. Every Friday I send home a note that informs parents of what is happening the following week. I include any special note that all parents should know about. There is a place to indicate weekly behavior, too. I have sent home a Friday note for years. It has always been super successful for me. This editable note makes weekly communication with parents a breeze! Click here to find out more about the Editable Friday Note. My newsletter is also a calendar. It’s editable and includes 12 different parent tip options – one click and they drop into the newsletter! Or I can type in my own! It has an optional behavior tracking component, dates already filled in (and updated FREE each year). Keep your parents informed about curriculum focus for the month and key “to-dos” for the month! Click here to read more about the Editable Monthly Newsletter. It is essential that you establish expected routines and behavior right from the beginning. Super strict in the beginning is important. Often difficult, but important. After the kiddos have proven they “get” the routine and expectation you can lighten up and relax a bit. Here are some posts about my behavior routines along with some FREEBIES. A complete and cohesive writing curriculum is SO important. Writing is one of those subjects that many teachers dread teaching or simply can’t find the time to fit in. Engaging Writing is a teacher and student LOVED resource. It makes teaching writing EASY and quick. It makes learning about writing fun and engaging. Check out this post to learn more about Engaging Writing. Everything I need for my small reading groups, some whole group lessons, independent work, word work AND assessment is included in Reading Foundations with Phonics! This series is a game changer! You can see more of how I use these resources on the 7 Key Components to Effective and Engaging Reading Instruction post. My kiddos love playing games, and working with interactive readers. When working with small groups, its important to have engaging and enriching independent activities for the other kids to work on. There is plenty to do with all of the phonic based work in these resources. You can check them out in my store. GE help and welcome addition to my math block. It is definitely a stand-alone curriculum, but it also supports other curriculum nicely. You can find out more about this amazing resource on the No Fuss Math Curriculum post. It truly is math instruction made easy! Math journals without the cut and paste, no prep games, posters, vocabulary, DOK Qs! Everything you need to effectively teach 1st grade math standards! Morning Wake Up has been part of my kids morning routine for many, many years. It is BEYOND effective. Because the work is routine, yet rigorous and increasingly more complex, the kiddos continue to grow and build concept mastery. There are Kindergarten, First Grade and Second Grade resources available. I’ve written about morning wake up MANY times, but this is the most recent post. I could go on FOREVER about the importance of organization! Check the organization tab here on my site for several posts about it. See my classroom reveal post for a few pics on how I organize a lot of things. The greatest advice I can give is you have to be organized. Just like you set routines and expectations for your students, do the same for yourself. Have an “in-box” that you go through on a set day each week. Don’t let things pile up and overwhelm you. Take a look around your room and make sure everything has a “home”. That will make everything so much easier! Backwards planning curriculum for the school year is essential. This 3 post series outlines exactly how to effectively plan for your school year to effectively cover your grade level standards AND be SUPER organized! I cannot imagine starting a school year without this! Backwards Planning for a Successful School Year! Digital planning has never expressed ME more than this planner. I can customize it to fit my specific needs! Sizing, colors, fonts, number of teaching blocks! There are so many starting template options. EVERYTHING is editable! This is the ULTIMATE teacher planner! The HUGE plus? I don’t have to re-write my plans each year, I can just tweak what I have. Additionally, I only typed in my routine things ONCE. Each week, all of my routines are already in place for me. The cool thing about this planner is it is a one time purchase. You can change and adapt it FOREVER to meet your ever-changing needs, likes and preferences. You can check out more about the Ultimate Weekly Teacher Planner here or find it in my store! There are a few resources that I use to begin the school year. Each adds a tremendous component to set the tone, expectation and excitement that the year will hold! Filled with fun “assessments” that provide me with a baseline and end up showing the tremendous student growth when those same pages are completed again at the end of the year! Read more about it on the Back to School, Already? post. Activities that are fun and mostly independent. These activities help some of those first day jitters to settle and allow you to complete all the crazy tasks that the first day requires. Find out more on the Easing Back Into School – 1st Day Fun post. Simply adorable and an effective adjective lessons resource! The culminating craft is a kid favorite and makes an adorable bulletin board! Find out more on the Adjective Mastery Through Shared Writing and More post. This resource contains a differentiated expository writing lesson, poster, and card game all about responsibility, good character and the golden rule! A definite must have for the beginning of the year. Find out more on the Writing with a Golden Ruler post. Ringing in the new school year with an effective opinion writing lesson is easy and effective with this resource! The lessons walk you through everything step-by-step and provide an opportunity for differentiation. Find out more on the Back to School Opinion Writing – An Exciting New School Year post. How Does Your Dragon Fly? Our little kiddos have a tendency to confuse questions with statements or stories. How many times have you heard or said the words “Any questions?” answered with a story instead of a question? This resource effectively helps primary students learn the difference. The craft is so cute, the included poster is super helpful. It even includes a 5 day lesson plan. Find out more on the How to Teach Kids the Difference Between Questions and Statements post. Thanks for hanging in for such a LONG post. Hopefully this round-up of back to school ideas, resources and essentials will be helpful as you head back to school. What are you most excited about? Are you nervous about anything? Your lil surfer kiddos are seriously the cutest and you know we LOVE your morning work!